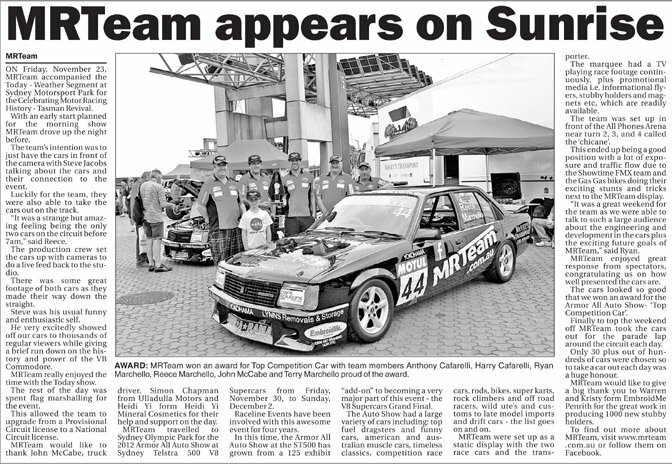 ON Friday, November 23, MRTeam accompanied the Today - Weather Segment at Sydney Motorsport Park for the Celebrating Motor Racing History - Tasman Revival. With an early start planned for the morning show MRTeam drove up the night before. The team’s intention was to just have the cars in front of the camera with Steve Jacobs talking about the cars and their connection to the event. Luckily for the team, they were also able to take the cars out on the track. “It was a strange but amazing feeling being the only two cars on the circuit before 7am,” said Reece. The production crew set the cars up with cameras to do a live feed back to the studio. There was some great footage of both cars as they made their way down the straight. Steve was his usual funny and enthusiastic self. He very excitedly showed off our cars to thousands of regular viewers while giving a brief run down on the history and power of the VB Commodore. MRTeam really enjoyed the time with the Today show. The rest of the day was spent flag marshalling for the event. This allowed the team to upgrade from a Provisional Circuit license to a National Circuit license. MRTeam would like to thank John McCabe, truck driver, Simon Chapman from Ulladulla Motors and Heidi Yi from Heidi Yi Mineral Cosmetics for their help and support on the day. MRTeam travelled to Sydney Olympic Park for the 2012 Armor All Auto Show at Sydney Telstra 500 V8 Supercars from Friday, November 30, to Sunday, December 2. Raceline Events have been involved with this awesome event for four years. In this time, the Armor All Auto Show at the ST500 has grown from a 125 exhibit “add-on” to becoming a very major part of this event - the V8 Supercars Grand Final. The Auto Show had a large variety of cars including: top fuel dragsters and funny cars, american and australian muscle cars, timeless classics, competition race cars, rods, bikes, super karts, rock climbers and off road racers, wild ute’s and customs to late model imports and drift cars - the list goes on and on. The team was set up in front of the All Phones Arena near turn 2, 3, and 4 called the ‘chicane’. This ended up being a good position with a lot of exposure and traffic flow due to the Showtime FMX team and the Gas Gas bikes doing their exciting stunts and tricks next to the MRTeam display. “It was a great weekend for the team as we were able to talk to such a large audience about the engineering and development in the cars plus the exciting future goals of MRTeam,” said Ryan. MRTeam enjoyed great response from spectators, congratulating us on how well presented the cars are. The cars looked so good that we won an award for the Armor All Auto Show- ‘Top Competition Car’. Finally to top the weekend off MRTeam took the cars out for the parade lap around the circuit each day. Only 30 plus out of hundreds of cars were chosen so to take a car out each day was a huge honour. Penrith for the great work in producing 1000 new stubby holders.